Also, make sure to rotate the nodes into the cylindrical analysis coord system. – Create a cylindrical system where the z-axis is the axis of symmetry. Let’s call it Coord 1. Connect the independent nodes on one side of the segment to dependent nodes which are revolved around the z-axis over an angle of 360/N, where N is the number of segments. The dependent nodes need not be part of the segment. They do not even need to be attached to elements. They are just used to define the number of segments in the model . In most situations the dependent nodes are also part of the segment when the segment exactly represents a “piece of cake”. 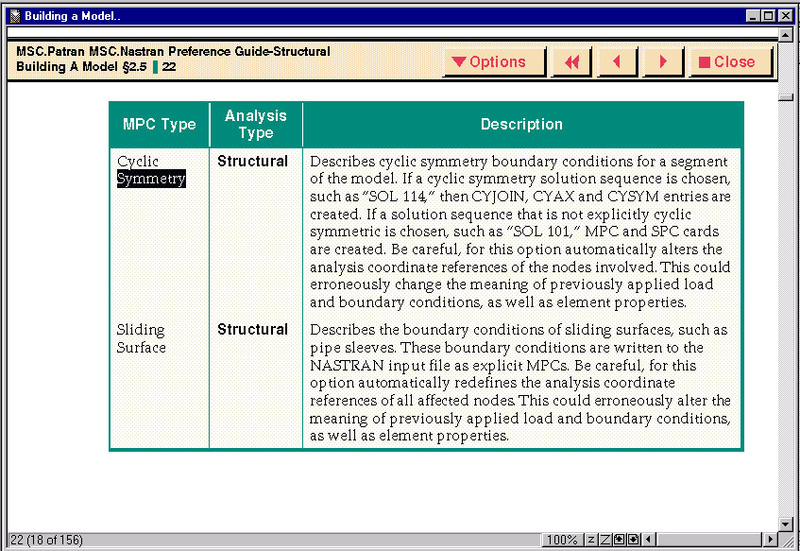 entries in the nastran input deck, one for side 1; the independent nodes and one for side two; the dependent nodes. t.i. nastran will create the new segments using the right hand rule by rotating around the z-axis in positive direction. In order to use the patran cyclic symmetry utility (see below), make sure all the nodes are defined in this cylindrical system, otherwise the in-plane eigenvectors are wrong!